Established sports & entertainment bar right on the seafront. Cocktails at sunset, private parties, DJs and theme nights. 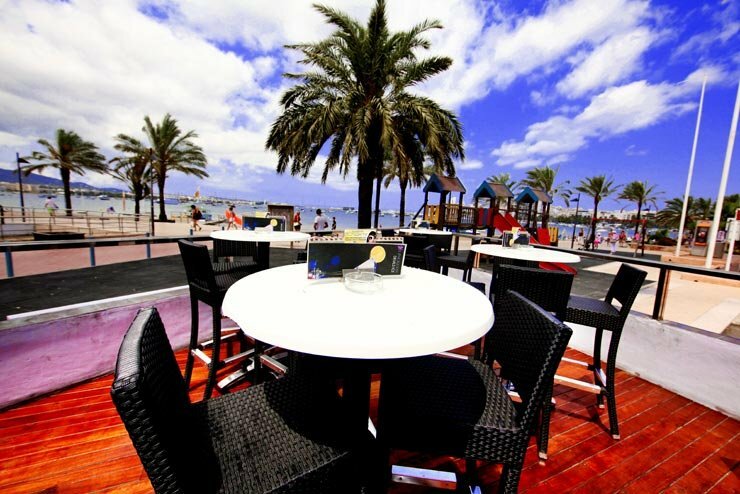 Situated right on San Antonio beachfront, Linekers Bar Ibiza is a great stop off point at any hour of the day or night. Open from 12:00 (except Mondays from 14:00) until 04:00, April to October, you can head to Linekers for a tasty lunch, watch any live sport on the large plasma screens (it is officially a sports bar during the day, so there's always something decent on), head ten steps across to the beach for a swim and come back in time for a cocktail or beer on one of Linekers' outdoor tables, perfect for sunset and people watching. Once the sun goes down, Linekers transforms into a crazy nightlife full on party destination where you can drink and dance the night away to sets from guest DJs and Linekers residents, all within walking distance of San Antonio's super clubs such as Es Paradis. Inside the crowd will be going crazy to the biggest summer tunes whilst dancing on the chairs and tables and even the bar top!! If you're after a more relaxed evening, you might choose to watch the sunset or chill out and relax from the party inside on the large terrace where they provide first class waiter service serving ice cold drinks. Linekers also is the ideal venue to celebrate your stag or hen party, offering you exclusive VIP booths to reserve in advance including bottle service. Fast-forward to the next day head back to Linekers for an orange juice in the sun to cure that hangover! Linekers seems to have it all covered, and is a much-loved landmark on the San Antonio scene.